We measure, manufacture and install all over the UK. Spiral, straight, helical or curved, we can apply leather to all styles and sizes of handrail. Design your own leather coffee/occasional table - any size, any colour or leather style. Let us transform your uninspiring handrail into an elegant interior feature. Create new, or transform old seating with a luxurious leather finish. Transform your staircase with leather. Whether it's straight, spiral, helical or curved. Call us for prices and samples. Choose from either 5 stock leather colours, or request a colour catalogue for a wider selection. Brackets also supplied in a variety of finishes. Whether straight or spiral, we can apply leather to all styles of handrail. Choose from an extensive selection of leather colours and styles. From bar areas to home offices and games rooms. We make bespoke furniture in leather, cowhide, wood and metal for individuals and commercial customers across the country. From our own workshop we are able to upholster, manufacture and paint every item we make, and fit on-site where required. 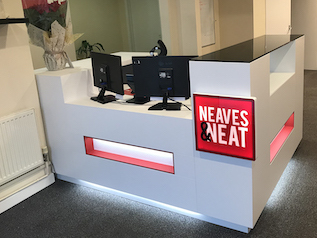 Our skills and experience can be relied upon to create any bespoke project incorporating a wide variety of materials: from timber to lighting, glass and high gloss paint finishes – all completed in-house and to your designs. 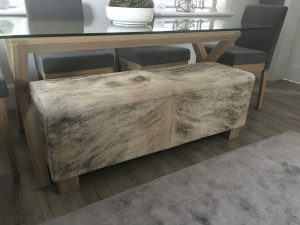 From storage benches to bar stools and tables, cowhide is a popular choice and a great accent piece in any interior space. All made to order and a variety of ‘hair-on-hide’ colours available. Make a feature with leather wall panels. Padded or flat panels in different shapes and styles. 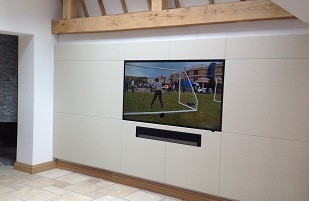 Choose your leather and stitch finish to transform around a TV, cupboards or other fixtures. We design, manufacture and fit. We are a Cambridge-based company with over 25 years experience in the interiors industry. We work with individuals and industry professionals to manufacture their ideas for amazing pieces of furniture. All our work is completed in-house or fitted on-site, and our workshop is fully equipped to handle the needs of our discerning customers. So whether it’s leatherwork, upholstery, woodwork, metalwork or paint finishes, our aim is to surpass your expectations. Call David or Hazel today on 01223 233437.